Born in Kemptville in 1964, Phil grew up playing sports in the area. At the age of 4, he began playing hockey joining the KDMHA with the Mighty Mite Seals, under the guidance of other Hall of Famers Dave Rigby, Ken Seymour, Lowell Craig and Bryson Patterson. Playing on many travelling teams throughout his minor hockey career, Phil’s highlight came as a member of the 1976 peewee team that won the Silver Stick Championship in Port Huron, Michigan.At the age of 15, Phil was drafted by the Nepean Raiders of the CJHL, playing the 1979-80 season here. The following spring, he was drafted in the third round by the Ottawa 67’s of the OHL and played with the team for the next 4 years under Coach Brian Kilrea. He completed his Junior career with a Memorial Cup victory in 1984. It was during this tournament while playing against the Laval Voisin team that Phil scored 2 goals and 1 assist in the 67’s 6-5 victory. He was selected at the first star. The second star was a guy named Mario Lemieux. 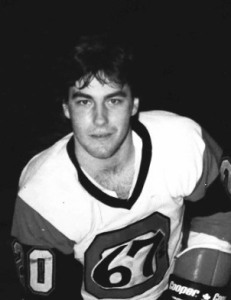 Phil was then selected in the 9th round of the 1982 NHL entry draft by the Chicago Black Hawks and played the 1984-85 season with the Milwaukee Admirals International Hockey League farm team, followed by two seasons of playing international hockey in Holland. Phil is now passionate about the game of golf and, along with numerous OVGA titles, has captured 13 Prescott Golf Club championships, has been a three time winner of the Eastern Ontario Whig Championship in Kingston and a three time winner of the Brockville Memorial Tournament.